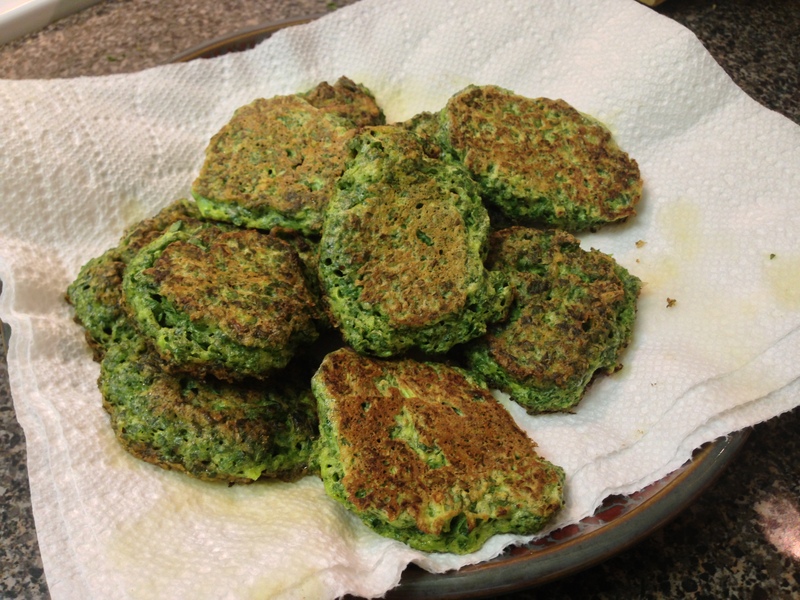 The Best Kale Recipe: Fritters! Kale is the new black. (At least I think it kind of still is…) I’ve never seen a leafy green so in-fashion! A few years ago, when I first heard rumours of this new “thing”, everyone was talking about it. “Kale is SO good!”, “Have you tried kale?”, “Superfood!”, “Nutrients!”, “Kale saves lives!”. It was all around me. Kale salad, kale smoothies, kale chips, sauteed kale…everyone in the world, it seemed, was being kale-ified. Of course I had to taste this veggie for myself! Kale is a leafy green vegetable that belongs to the Brassica family, a group of veggies including cabbage and brussels sprouts. I always say it looks like huge, curly spinach. It’s a little bit tougher, and some say it has a bit more of a bitter flavour. It has been called a superfood and one of the healthiest foods in the world. It is packed with nutrients and has a ton of health benefits, while also low in calories. Here’s a top 10 list of kale health benefits. Kale can be eaten raw or cooked. I absolutely love it (although I don’t think there’s a single vegetable that I don’t love). The problem I had with kale was that I didn’t know a lot of kale recipes. I never knew what else I could do with it, other than sauteeing it with garlic or making a salad. I mean, I love kale salad, but there’s got to be other ways to eat this stuff… And I found out that there definitely are! Here is one of my new kale favourites! 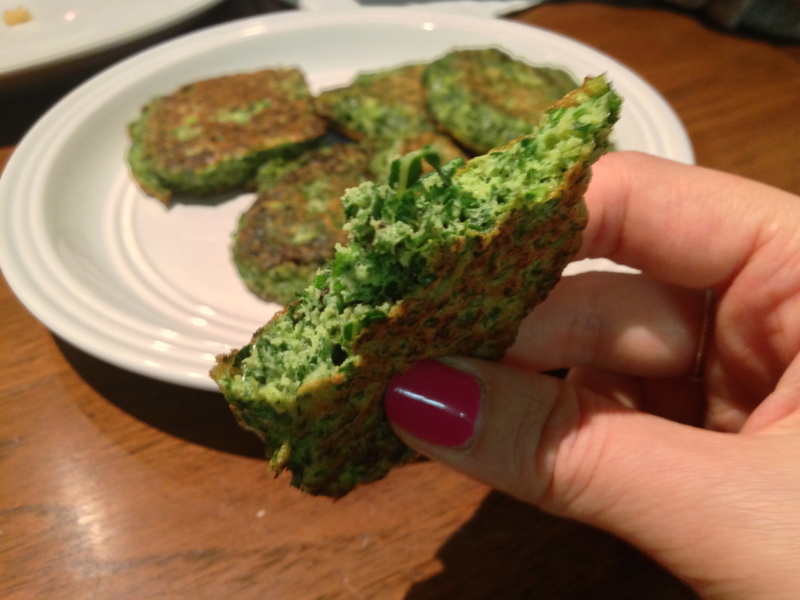 Delicious kale fritters! Flavourful and full of kale (and spicy if you want). They’re so hard to resist! The recipe is pretty simple. You make a kale batter, and fry ’em like pancakes! Don’t skimp on salt! (Well you can if you want.) It makes them that much more irresistible! 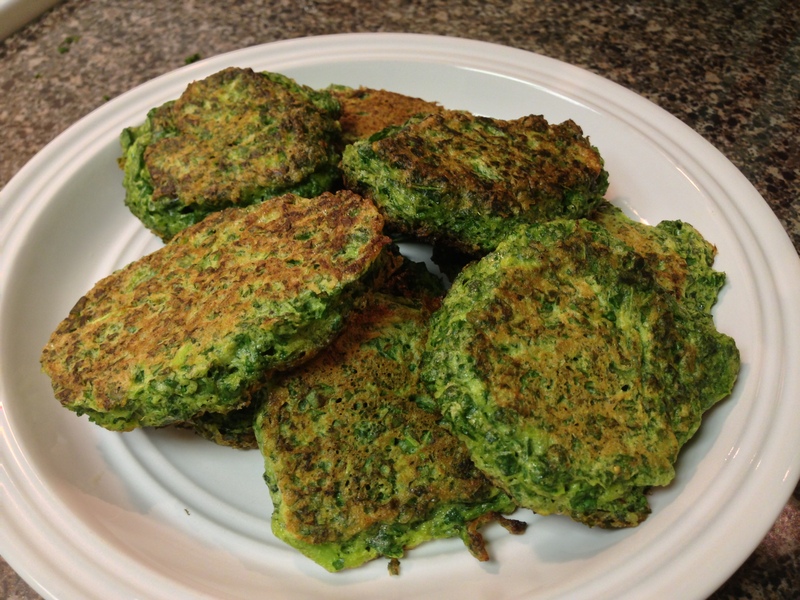 They’re like potato latkes turned green, light and fluffy! Bet you can’t eat just one! You may add or omit any spices you like or don’t like. 2 heaping cups of kale leaves. About 4-5 large leave of kale (The bunch I bought was huge, and the leaves were huge, use more or less kale depending on the size of your leaves.) This should be about 2 cups worth once you’ve put the leaves through the food processor. 1. Combine kale leaves, ginger, ground cumin, onion powder, garlic powder, cayenne pepper and ground pepper in food processor. Pulse/process until all the kale is chopped up. Transfer to a medium bowl. If all the kale won’t fit in the processor at once, process in batches. Don’t over-process, you don’t want your kale to become a paste/puree. It should look like chopped leaves. 2. Add water, flour, baking powder and egg yolks. MIX WELL. 3. In another bowl, beat the egg whites with an electric mixer until they hold peaks but are not too stiff. They’ll first get bubbly and then turn to a light fluffy foam. 4. Fold egg whites (beaten) into the kale mixture. 6. Drop the kale batter in spoonfuls onto the hot pan. Fry for about 3 minutes on each side. The fritters should be a golden brown colour. You can turn the heat down a bit once they get frying. It’s a pretty quick process. Add more oil as needed. 7. I fried 5 at a time. When they’re done, transfer to a paper towel-lined plate to absorb excess oil. 8. Serve with sour cream, a chutney or another dip of your choice. Very cool. Will have to try these, because yes there are not a whole lot of various recipes and concepts I’ve seen with kale for as much of a superfood it is claimed to be. Thanks! Ya, give them a try! They’re pretty easy. I’m on a kale recipe hunt. I’m always just making salads and kale chips! If you have any good kale ideas, let me know! I love kale, too. I cook so often with it, omelette, pizza, soup, salad, fried rice, etc. that I forget to post about them, but I will let you know if I come up with a brilliant idea 😉 The fritters look delicious! Ya! 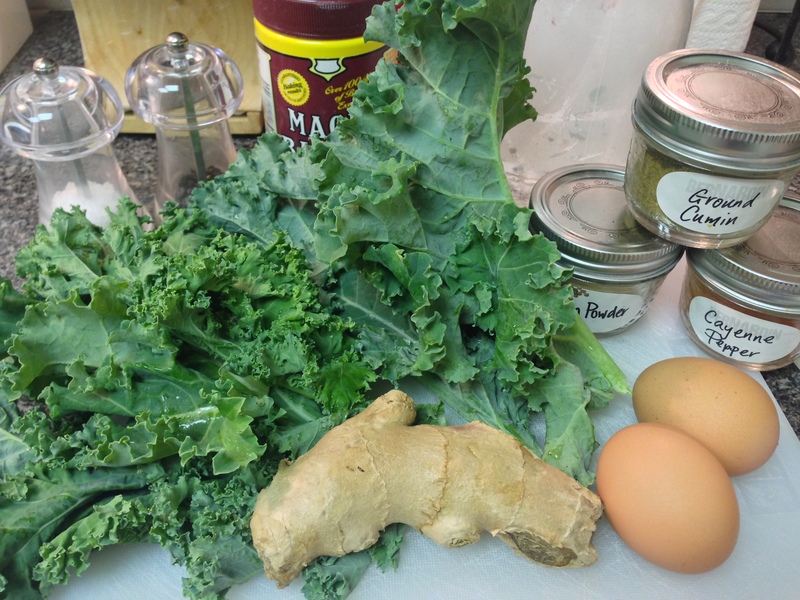 I had so little kale recipes…it was always just salads, because I don’t make smoothies very often. This recipe is a good change! And tasty!!! Thank you so much for this recipe. It is absolutely delicious! I have linked your recipe on my blog i hope you don’t mind. Can the batter or cooked patties be stored/refrigerated for later use? Would love to make this, but wouldn’t consume them all in one sitting! It’s true, that’s a lot of fritters for one to eat at once! To be honest, I’ve never tried freezing them or using the batter later. I worry the batter may liquefy a little if it sits overnight. I’ll experiment with the freezing and get back to you if it works. You could also try cutting the recipe in half and making less batter. Sorry I couldn’t be of more help! If you end up finding any good solutions, let me know! Thank you. I cooked them today and it’s delicious. These look really good! Thank you for the recipe, I will definitely try them :D.
Very nice they turned out great I added just a tiny bit of fresh child. In Portugal we use kale in quite a few recipes if you guys want a nice soup google caldo verde soup is a tradicional soup we have in New Years night . Just another recipe with kale they are not many. So glad you gave this recipe a try! I’m hoping you meant ‘fresh chile’ and not ‘fresh child’. Haha, that gave me a good laugh. Thank you so much for this recipe. I had bought a big thing of kale and was finding I just wasn’t into it (as a salad) but didn’t want to waste it… this recipe was perfect!